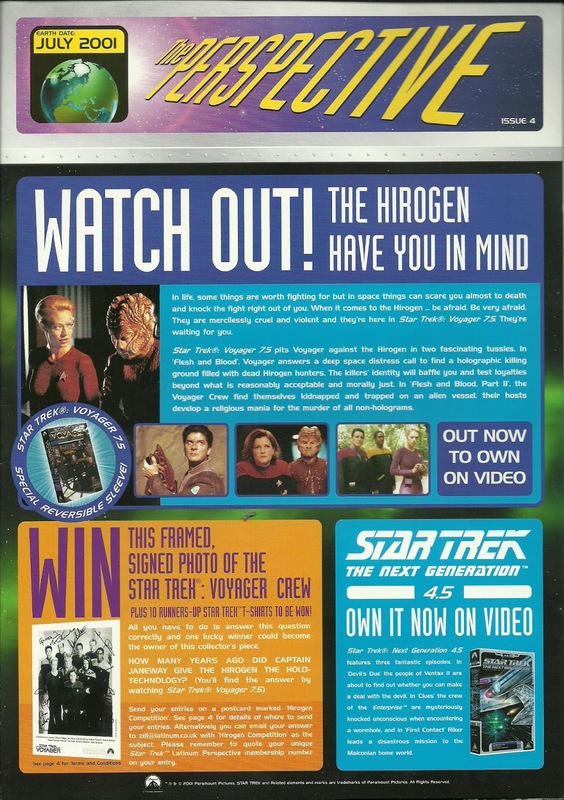 CIC Video was the bastion of all things new, visual and Star Trek until 1999. As we saw in Part 1, CIC held court over The Original Series, The Next Generation and Deep Space Nine until volume 7.13 of the space station saga which was actually overseen by Paramount Home Entertainment (which had swallowed up CIC). 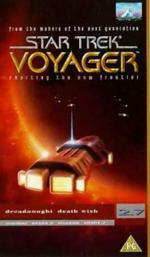 Star Trek: Voyager likewise shifted across to Paramount Home Entertainment for seasons six and seven. By this time it was getting hit and miss with SKY as to whether you could catch a new episode on VHS or TV first, purely down to which series was airing first on the satellite channels. For the majority it was still a case of hitting the shops for a fix (internet shopping was only just starting out) but on the outside the effort was a distinctive departure from anything before. Let's travel back ever so slightly to the first season of Voyager. 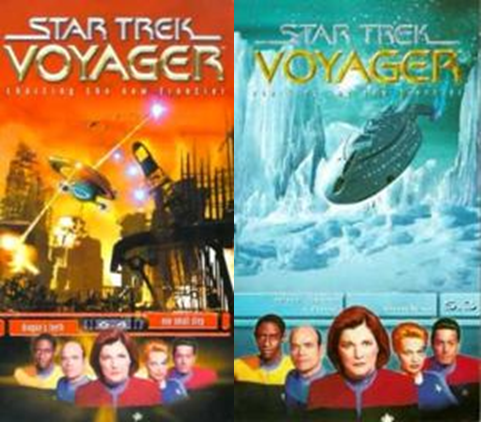 While the video covers of the previous two series had been, on the whole, pretty standard with a firm concept across the range from beginning to end, Voyager couldn't settle on a single theme for even two seasons in sequence. In contrast to The Next Generation and Deep Space Nine there was very little consistency from one cover to the next even from the start. Only the title and the placement of episode info, titles and legal panels would remain the same. Also remaining in place for the whole of the run was the tagline Charting the New Frontier below the series title. 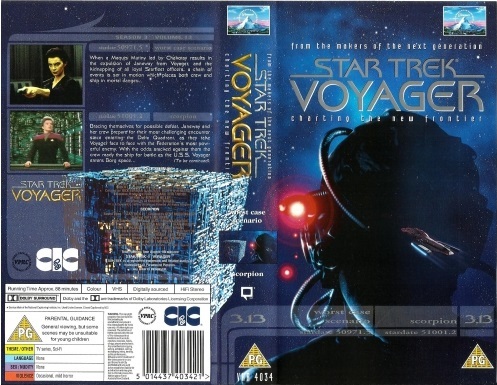 Until season four it was also accompanied by the legend that Voyager was from the makers of The Next Generation - whether they pulled this through a radical redesign or embarrassment is open for debate(!). 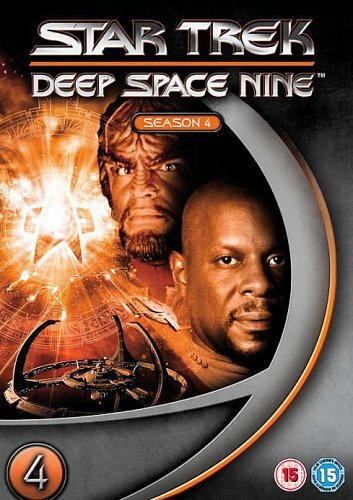 Nor was there any connection between volumes as with Deep Space Nine's galaxy spanning spine picture. All you got here was a smaller image of the whole sleeve clean of any promo script and the episode titles. Aside from that there were only fleeting glimpses of what could have been or concepts that failed after a volume or two. In fact it would be fair to say the whole series was a mishmash from a packaging sense with no consistency at all. What was the consistent factor across every volume was the numbering system. 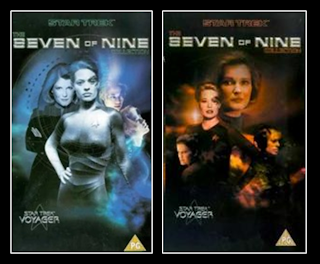 When Voyager started, Deep Space Nine also changed to the same season/volume numeration. 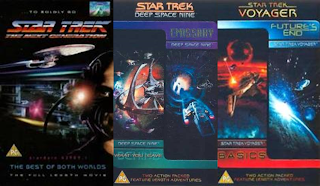 Take season one for instance - 10 covers (episodes were released in production order for seasons one and two in the UK) featuring the ship from various angles - flying, in space, by a nebula, grounded...all very exciting (sarcasm). 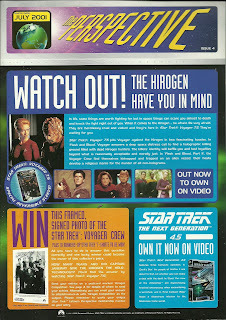 Season two was only a slight improvement with artist impression images featuring the ship as well as shuttlecraft, the Dreadnought missle, Kazon warships and Vidiian cruisers Each image related to one of the stories on the cassettes as had the first season Voyager closeups. The third year went off at a completely different tangent and considering the quality of the volume images before, it was more of a downturn as artistic images made way for photoshopped images of cast members/scenes from episodes on the tapes. Volume 3.6 featured here was one of the worst offenders - how big is Janeway supposed to be in that Jeffries Tube?! Common sense and giving a toss seemed to have left the building during this season. You thought they might have at least made some effort and in fact it just looked rushed. While I was more of a DS9er at heart I did own a few Voyager volumes although admittedly at the time, none from season three. The last cover for Scorpion was OK but I always felt they missed the boat on impact with this show. Now remember the rumour mill and hype that built up around the expected arrival of the Borg in season three? It's all about the buildup to that final shot at the end of Blood Fever if you recall and the note that Voyager is heading into dangerous territory. So a good move would be, what? I know - stick that on the cover of the cassette and ruin the surprise (although you suspect marketing came up with that to shift a few more copies). It made for a good cover nevertheless but that shot of the drone corpse was in the dying seconds of the episode as a moment of suspense which this obliterated before you got out of the shop. If we expected improvement for season four it was almost as iffy with 4.1 and 4.2 opting for "cast member of the week" shots (Seven of Nine on 4.1 and Chakotay on 4.2) before diving into a full range of "Janeway + crew/guest" right up to 4.13. In the bottom right hand corner this cast shot pairing was also accompanied by some kind of spaceborne image relevant to the cassette and only on one occasion did it feature characters (the Hirogen) on 4.9 for The Killing Game (Part I). 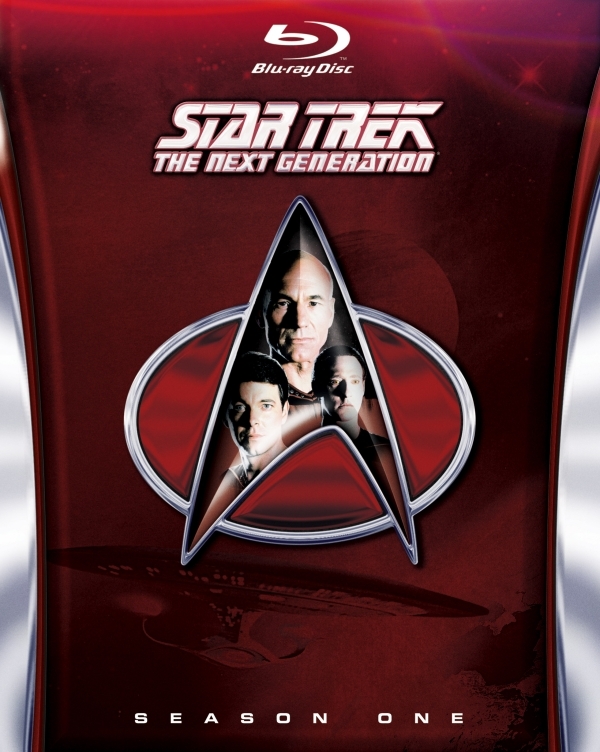 The quality of the images did improve for seasons five through seven which also introduced the generic cast image at the bottom and moved the episode numbering and titles into a set format near the bottom of the cover. Likewise this happened with the final season of Deep Space Nine as I noted last time although with Voyager we had five crew (Tuvok, The Doctor, Janeway, Seven of Nine and Chakotay) to three (Worf, Sisko, Kira) on the sister series. Already with season four the episodic stardates had been removed - another feature which was implemented on Deep Space Nine in the same year. The penultimate season probably had the most interesting and well-designed artwork with more action shots and interpretations of sequences from the episodes based around the ship rather than the characters. But that's just the front of the cases - what about the whole package? While it didn't fade back into the simple designs of The Original Series or The Next Generation, the take on the packaging was different again. It gave the feel of technology and Starfleet by design and was one more thing that made a visit to the shops on release day a little more interesting. On the outside rear of each case was, as with previous shows, a brief six line synopsis for each of the episodes with a fairly respectable image for each also printed. These were less grainy than the screenshots on The Next Generation and were one of the better things about the cases. On the inside of each volume could be found some information about the ship, a new alien race, technology and also a character biography. 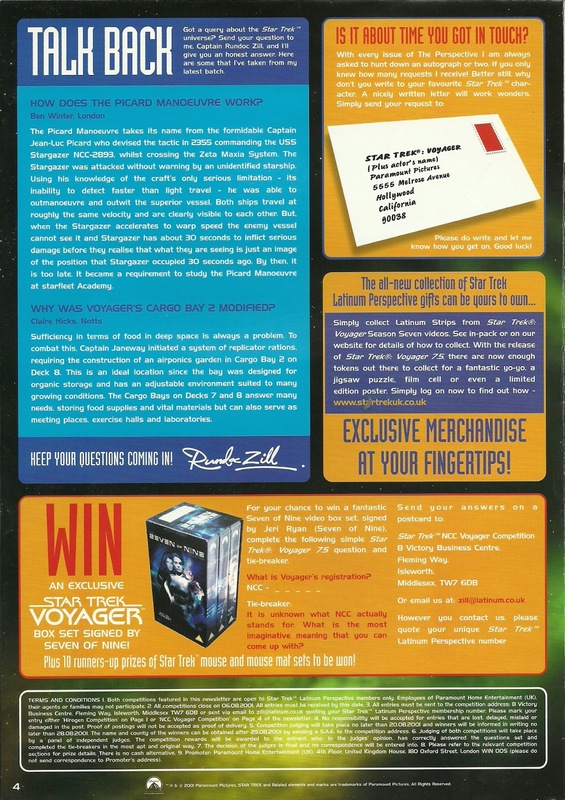 While not as "in depth" as the Deep Space Nine volumes it kept with the theme of the case and the LCARS display style that was echoed across the box. Stupidly I have failed to scan in any images from the interior box art and if anyone has some, please send me a copy! Now last time I waxed on about how good the covers were and the special edition versions of a few that existed. 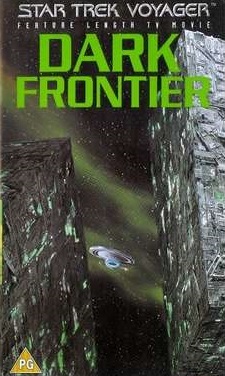 With Voyager it only made it as far as three alterations to the standard design over the course of seven seasons. These were Dark Frontier, Flesh and Blood and Endgame. The latter two featured reversible covers so that casual collectors could ditch the series/volume numbering system and have a "movie" cover instead. This meant that the interior info was ditched for these two cassettes. With Dark Frontier not only was there a reversible sleeve version but Paramount also released a card-boxed special edition in black and green as a one off. This didn't have the numbering or reversible sleeve and was, I think, an HMV exclusive in the UK. Just dropped back to a previous comment, there were some good covers along the way although most were from the later years. The cover for Timeless in season five was always something that stuck in my mind as it's probably one of the show's biggest moments. Equally the picture for Dragon's Teeth in season six was unusual with Voyager taking evasive action within the atmosphere of a planet. Little different but I always felt Voyager never really had room for maneuver on the covers leaving it with a limited range to explore. Now before I move over to Enterprise, this would also be the last series to offer two part episodes in a TV movie format. The Next Generation did this with all of its double episode stories including Encounter at Farpoint and All Good Things... Over on Deep Space Nine, only the pilot, Emissary and What You Leave Behind got the special treatment. However, they would be placed onto a single video while each The Next Generation movie got its own volume. 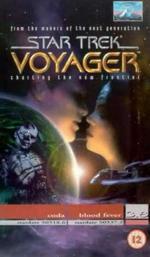 Voyager's two-parters suffered as well with two movies being slapped onto a single VHS tape. A bit of a marketing gimmick all round but again, great if you weren't collecting the full set and even better if you get disgruntled with CIC/Paramount's constant ability to schedule two part stories over two cassettes as happened on more occasions than not. Image quality on the front wasn't amazing but they did their job. I can probably name a handful of instances across The Next Generation, Deep Space Nine and Voyager where that didn't happen at best. For reference (above left) I've included one from each of these series. There were no interior info panels and the rear cover managed to offer plot details and credits. Definitely a budget run! I think in my video buying era I managed only the Redemption TV movie and the Basics & Future's End and Scorpion & Year of Hell editions due to financial restraints. They were good but I always preferred that cliffhanger moment because that's how they were designed to be seen in the first place. From memory the only other special edition that I laid my hands on as part of the VHS collection I had was the awesome Borg box set from The Next Generation. Three cassettes in a cardboard Borg ship. When you took the lid off the sides folded flat with each volume seated in one of the sides and the fourth carrying a bit of blurb on the Star Trek villains. Placing all three cassette cases in a row spelt out the word "Borg". It was very cool although the case itself was quite flimsy. It was released around the same time as the Q box set which seemed a bit of a rip off as Q Who was in both cases. Apart from that I managed to avoid specials but the good ones managed to creep in if I let them! Also for the sake of this piece I'm avoiding heading into special editions territory. 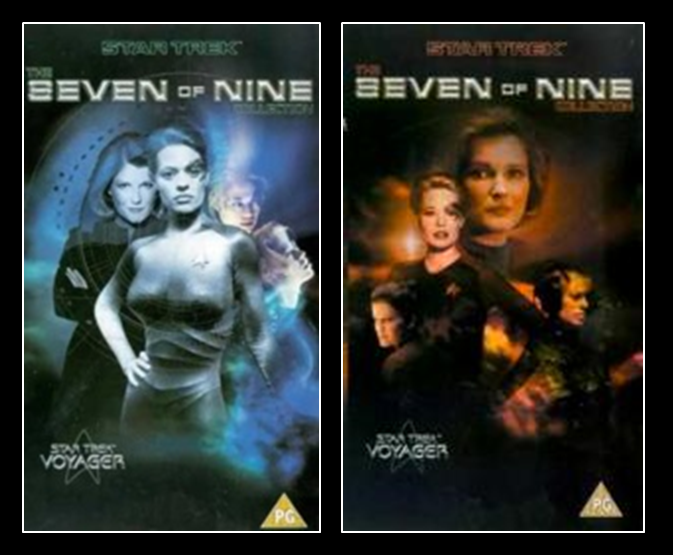 HOWEVER (yeah, you saw that coming), I did have the Seven of Nine Collection Part One from Voyager. While the The Next Generation went overboard on box sets after it finished, Deep Space Nine missed the boat and all we got from Voyager aside from the two part tapes was a split collection featuring Seven's "Greatest Hits". Each contained three cassettes and eight episodes across them. Part One featured Revulsion, Retrospect, One, Hope and Fear, Night, Drone, Infinite Regress and Bliss while Part Two included Scorpion, Scientific Method, Dark Frontier, Think Tank, Survival Instinct and The Voyager Conspiracy. The three cassettes in each all bore the same artwork and when the two sets were pushed together there was a full image of Seven's face. They also came with a set of stills from the episodes included. I only bought set one as I had most of two from original release. Oddly there was an 11 month gap between the release of these two sets which I suspect was due to the episodes on the second release only just being out on their own with the full Voyager range at the time. By the time Enterprise came onto VHS in 2002, DVD was on the rise and I recall that even I had started switching across to this newer format. Only one season of Enterprise actually made it onto cassette and I purchased the whole lot for my sins, making it only one of two seasons along with Deep Space Nine's final year that I had complete. I even had the cardboard collectors case to hold them all in. The budget on the packaging had certainly been reduced with no internal info and minimal detail on the box. You could collect tokens for themed Enterprise items and I ended up with a metallic organiser (lost to the mists of time). If you collected all the volumes together the spines made an image of the NX-01 crossing the galaxy and mini-screenshots from the historical title sequence at the bottom of the spine (see 1.4 left). 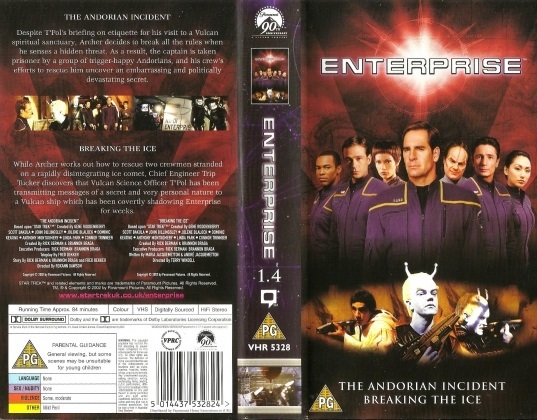 There would be only one more VHS release from Paramount after the first season of Enterprise and post 2003 - Star Trek Nemesis; which in turn was the first Star Trek movie I bought on DVD! Overall the design was quite striking with background colour changes on each volume. 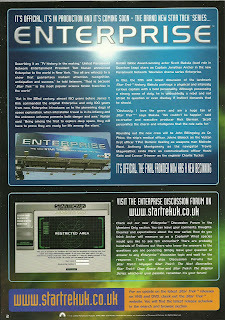 Enterprise was at least consistent in its VHS design concept which made it a step up from the randomness incurred by Voyager but still wasn't (in my opinion) as exciting to see in the shelves as the Deep Space Nine editions. 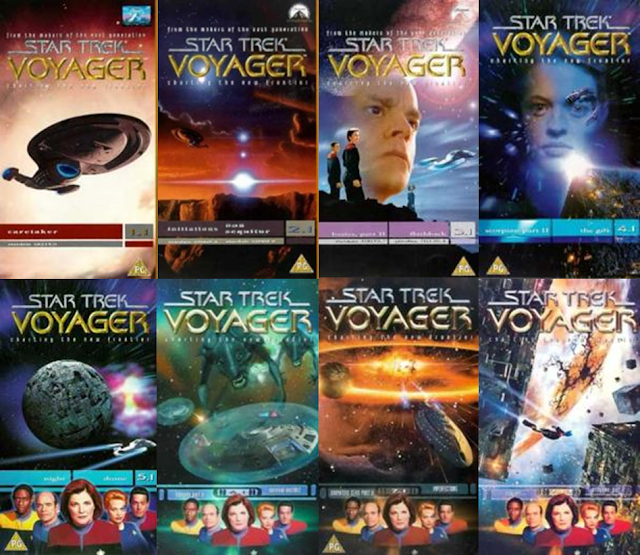 To the rear there were, as with The Next Generation and Voyager, images (usually four in a row) from the two episodes plus the usual episodic synopsis and credits. Interestingly the covers would also be the first to include a web address for you to see more Paramount info on the videos. 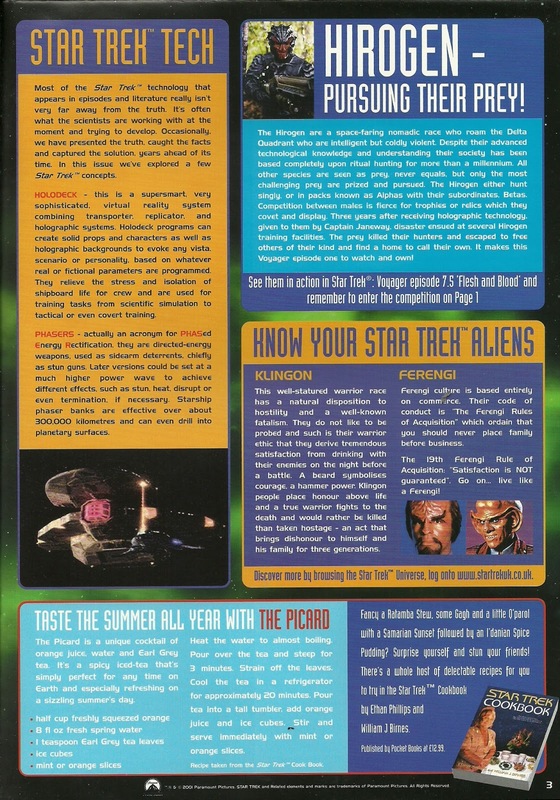 When Paramount took over the video releases for Deep Space Nine and Voyager they also started producing regular newsletters which you could subscribe to. The information was variable and sometimes it would arrive after the videos previewed (ironically) had been released. They were not exactly the most reliable form of information but in light of the fact that the internet was clunky as hell in the late 1990's and early 2000's it was better quality. I managed to find this edition from July 2001 when Flesh and Blood was released on VHS as well as the rereleased The Next Generation episodes Devil's Due, Clues and First Contact. 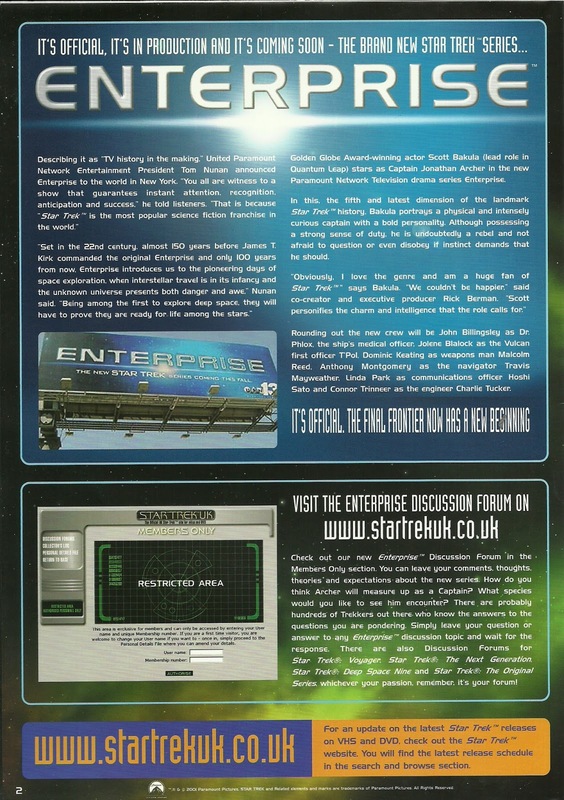 The thing that probably caught your eye will have been the announcement of Enterprise on the second page. 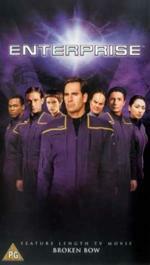 Odd to think that this was before the series had aired and we were looking forward to a Star Trek prequel! 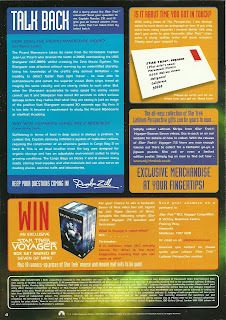 The www.startrekuk.co.uk website is now a very underused fan page and has nothing to do with Paramount or CIC. A shame but I guess that's just the passage of time! Also I talked about some of the promotions that were run with your purchases. The later ones were called the Latinum Perspective and there were some great items (they were at the time) which you could collect points from across the VHS cassettes from Deep Space Nine and Voyager. While I've lost a Star Trek VI magazine these have survived. Explain that one. Looking back I'm not sure if I would get any of these now and to get any of the better items you needed to get every single VHS volume from any series that was being released. 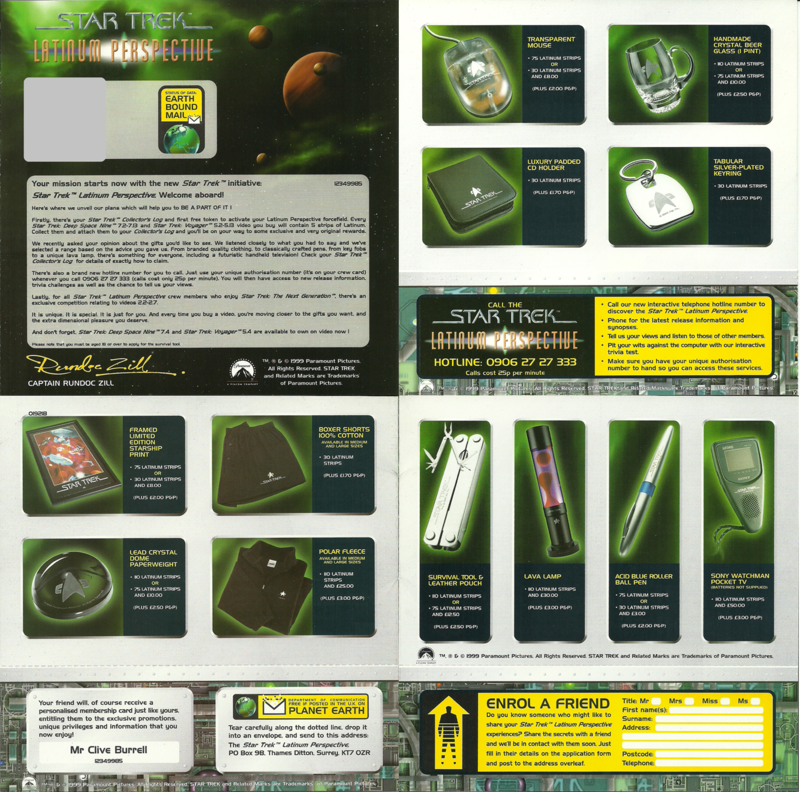 Tough on the wallet for a pair of logo embossed boxer shorts or a lead crystal dome paperweight but at least there was something for customer loyalty after purchasing a lot of Star Trek! And that's it. Two parts, five series and a lot of pictures. In the end I chose to focus on the series rather than diverting into the multiple different sets and covers that pervaded the movies across the years. I always found the VHS styling a wonderful side piece to the episodes themselves. It's a shame this isn't something carried on today however the advent of DVD and special features killed the need to make the boxes more exciting when you can navigate a menu and be provided with the same information in a much more interactive form. Basically the cover here was that special feature menu. Now on the blu-rays and DVDs you can get character profiles, cast memories, effects documentaries, outtakes, previews and much more than you could ever fit onto a sheet of glossy A4 and insert into a VHS plastic case. The tragic loss with this more compact technology is the "sameness" which crosses the box sets. Each disc case is the same, there is minimal variety and the visual, digital content becomes the total focus and how it is presented becomes secondary or even tertiary. It belays, sadly, just how much we are now consumed by digital media and tragically tend to want to spend less time reading related information when we can watch and listen. Not only that but the art of browsing itself is dying and the need to grab people's attention in a shop is diminishing. Artwork is a minimal requirement when you are purchasing online for the content alone. Instead of scanning your eyes over a shelf, the search box becomes your eyes and the exterior box becomes just a way to transport the item and nothing more. It's sad to think how our consumption by the internet has taken away one of the unique selling points of the Star Trek story and consigned it to, ironically, a series of pictures on a search engine.